What is Evidence Based Integrative Oncology? This is the selective use of scientifically researched and validated Complementary Therapies to support patients with cancer. 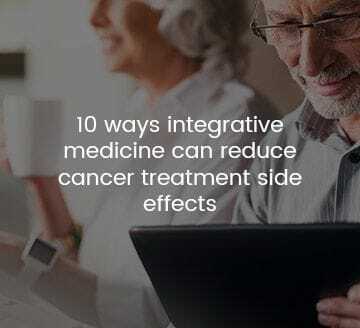 Not all Natural Medicines are backed by scientific research, and at MIOG we only offer selected therapies that have been shown to be beneficial in Integrative Oncology Care. Our approach to Integrative Oncology involves the creation of a fully personalised plan. This is a three part process and can take at least seven hours of case taking and research time. Before you come to the initial consultation, we ask that you gather as much information as you can about your health status including: blood tests, X-ray/MRI/CT scans and reports, pathology reports, surgery reports or any other documentation that may be relevant. This also includes previous treatments and any current medications that you may be taking. We then sit down and take a detailed case history in the initial consultation. We may conduct examinations or recommend further testing at this point. We prefer an open forum of communication with your Health Care team and will request contact details for any communication that is required. We then take all of your information and analyse the test results, examine research about your exact cancer type and staging, review case history information regarding your digestive, detoxification ability and nervous system, and prepare a summary of the most relevant evidence-based Complementary therapies for your current situation. At MIOG, all practitioners discuss each new patient's case at our weekly Multi-Discipline Meetings in order to tailor the most appropriate supportive program for you. Finally, we prepare a fully personalised written Integrative Oncology Plan, communicate the suggestions with your Oncology team via email and prepare a folder of information to present to you at the follow up consultation.